The PM becomes a scrum master. MS Project (or something similar) is replaced by a Jira account. Dev teams have stand-up meetings every day. Hooray! We have done it! We are now agile. Agile. Possibly the most misunderstood methodology in big corporate companies today. I think the problem, as with many things in a big corporate, is that growth/progress does not happen naturally. It’s orchestrated with new teams, more people and more money. We learn how to become agile, rather than what agile is, and what we end up with is some mixture called water-scrum-fall. So the main goal of “going agile” in your company is to be able to move quickly and easily. If you have already gone agile, and you are not moving quickly, easily you have done something wrong. You have to involve business ! It’s OK to change your mind. It’s OK to do it wrong initially. Most of the time we are just a waterfall team in agile clothing. Usually the business units hear about this thing called agile that will get them their solutions quicker. Of course they want that! Who would not? They do not really want to know anything more, just deliver quicker please. Use agile! You have to (really have to!) involve business if you want to become truly agile. In fact, I would argue that breaking down the line between business and IT will do more for your agility than any sprint or stand-up meeting. 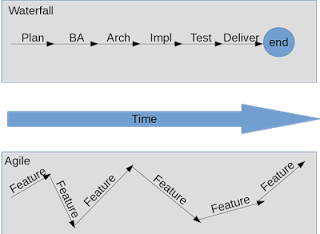 Over time, there might be no difference in the speed of the delivery if you compare waterfall to agile. and do a big bang, flawless implementation into your production environment over some weekend. 6 months later and you have your solution in prod, working like a dream. Doing this the agile way might also take 6 months, maybe more, maybe less. You are just implementing this, feature by feature, into production until all is done. Agile is not about speed!! It’s about the fact that we rarely know what we want. (Let alone what our customers want) It’s about the ability to change, quickly. So going agile allows us to move the end goal around. We do not have to know where we will end up. Let your customers guide you. Another nice way to think about it is Adaptive vs. Predictive. With waterfall you have to predict into the future what needs to happen. You have to get this right, else you waste time (and we all know time is money). That is why you plan. That is why you architect to cater for all sorts of possible changes. There are many books with all sorts of patterns to help you implement a system that can do more than what the client wants to try and cater for future changes. You have to get it spot on though, and that is close to impossible. Don’t get me wrong, I am not saying that implementing architectural patterns is wrong. It’s just that sometimes we over engineer a system because we need to predict the future. We should rather become more adaptive to change. (because change is the only constant). This is where the stand up meetings come from. The goal behind the stand-up meeting is to force business and developers to interact. You can also achieve this in another way, eg. make the project teams (business and developers) sit together. Do not do big up-front architecture. Evolutionary architecture and clean design principles is the way to go. Yip - not the number of Jira numbers closed! We do not complain that business changed their mind again, in fact we encourage it. Change is OK! We need to get working software in Production, no big bang implementation. (Remember Production does not necessarily mean Live). Don’t get caught up in the rituals. These are all great methodologies that all got together to create the agile methodology. 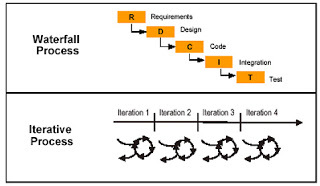 It does not really matter what methodology you follow, stick to the agile principles. Be pragmatic. So do not let your rituals, processes and tools force you in a direction, let your agility use processes and tools to help implement the agile principles. If it does not work for you let it go. Measure yourself against the delivery of working software. Continually improve. Do not try and force agile onto a team, rather make sure that the natural operation of your team is agile. Enable them to become agile.